First of all, thank you for downloading our app! We have spent a lot of hours testing, coding, and perfecting what we feel is the best app for notifiying you of your device's connection information. 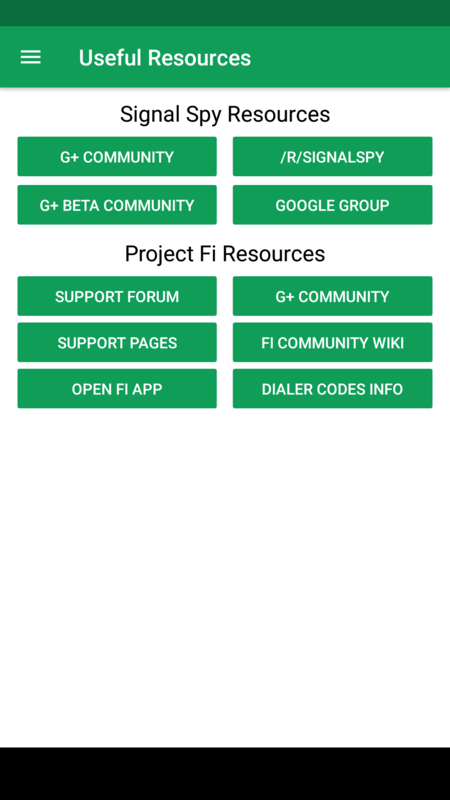 We are also proud to be the original Project Fi™ companion app. We are no where near done, and as such this page will be updated with the great new features that will be rolling out in the future. When you first load our app, you should come across our landing page. This is the central hub of Signal Spy. You can easily see how your device is connected to cellular towers and WiFi access points. Feel free to report the network information if the cellular information isn't available! Finally, on this main page, we provide some useful links and shortcuts. The first is to the history portion of Signal Spy. 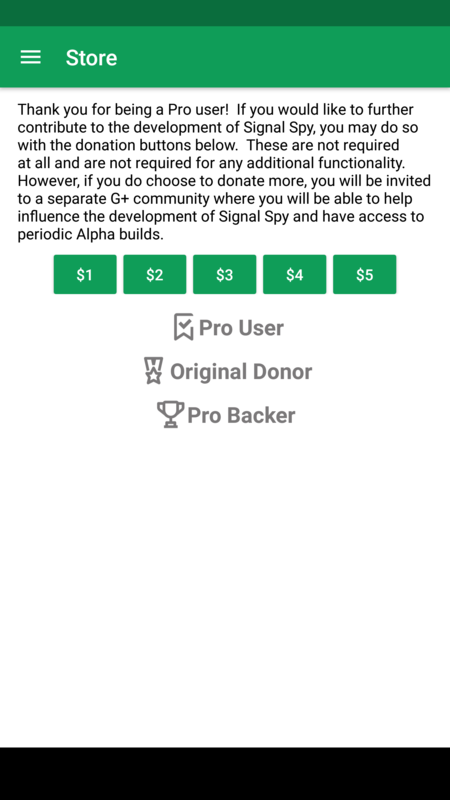 There is a link to the store portion of Signal Spy, where you can upgrade to Pro. We also provide a link to our Google+ community, where you can interact with fellow Signal Spy users and keep up with announcements from the developers! Links to this getting started page, as well as the FAQ page of our website, are also included. Finally, for Pro users, we provide a dialer code library that allows you to dial any of the codes our app provides quickly and easily in one place! 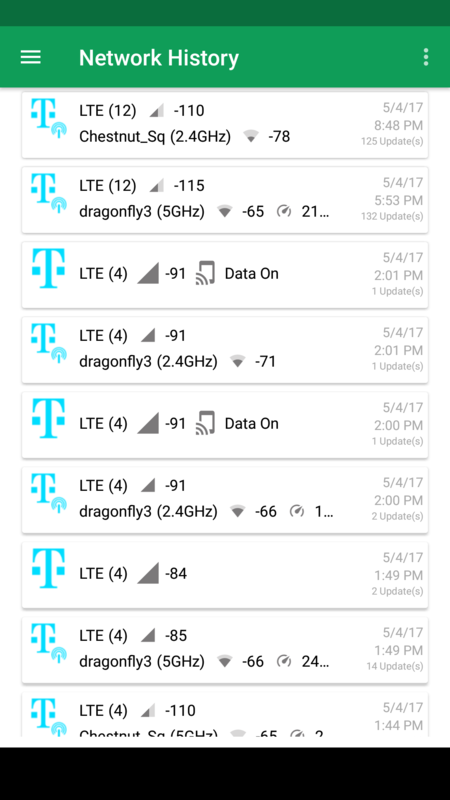 If you ever wanted to see how you connected during your day, how often you changed carriers, or what the name of that random Wi-Fi hotspot you auto-connected to, this is the page for you! For free users, you will only see the name of the carrier being used (or airplane mode) and the name of the Wi-Fi network you were connected to (if any). For Pro users, you'll see the history menu above. It'll provide more granular details about the signal levels, what cellular technologies were being used, if applicable, what bands, as well as the approximate location. This feature is great if you want to know where you had signal issues or for bug reporting purposes. Project Fi provides you updates on how much data you're using, but you can only see it cumulatively over your current billing statement, not per day or per app. Signal Spy does! For free users, you'll be able to see all of the apps that used data today, along with the amount used, sorted alphabetically. For Pro users, you'll be able to sort by data used, see data usage over a number of days, and be able to see data usage of each app per Fi network.. If you download our app, we know that you are really into Project Fi™ and want to know as much as you can. If you want to be amongst like minded users, or want to get easy access to other useful material, this page has it all! 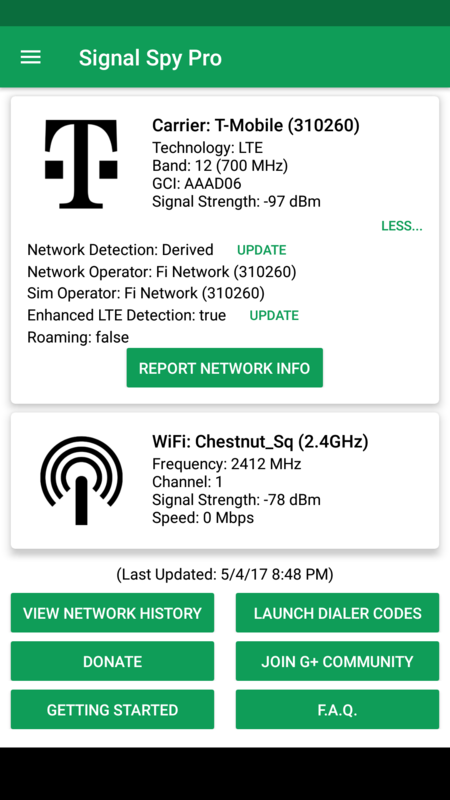 You can click on any of the buttons to go to specific communities for Signal Spy or Project Fi™. You can also click to link to articles on dialer codes, to open the Project, or for Nexus 6 owners, the LTE engineering app. Apps are nothing unless they can be tailored to the experience that is best for you. We have worked hard to provide the options that users have requested the most. Many of our top questions or feature requests are actually taken care of on this page! 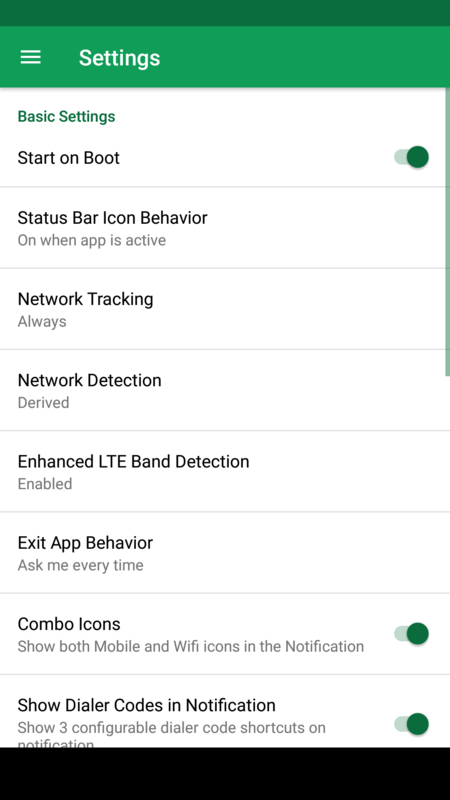 Enhanced LTE Band Detection: For Android N users, get the most accurate band detection on any carrier. 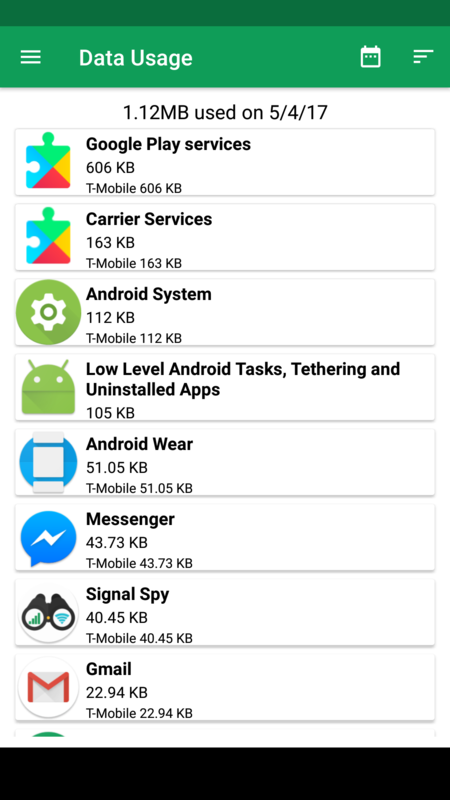 Android M users can get band connectivity info collected by N users. If you are a free user, you can upgrade to pro for $2. 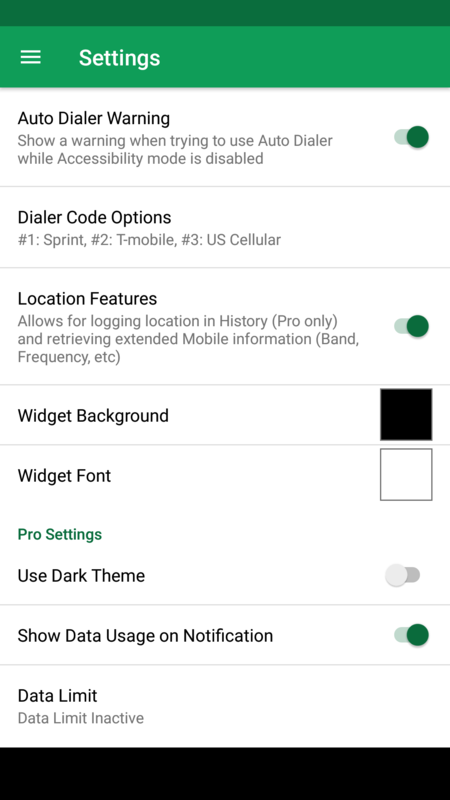 This adds not only the extra history features we mentioned before, but it also removes ads, enables root and rootless copy-free dialer codes, and more features as our app grows. You can also donate beyond $2 if you are so inclined and become a Backer! We appreciate it! We hope you enjoy Signal Spy! If you run into any problems or are not satisfied, we want to hear from you! We are here to help. © Novvia, LLC All Rights Reserved.